Since 2009, I have been using and making PrayerMalas. I found that in making them, I was meditating and that energy and love was going into each string of beads. Every bead I chose was a prayer in itself. 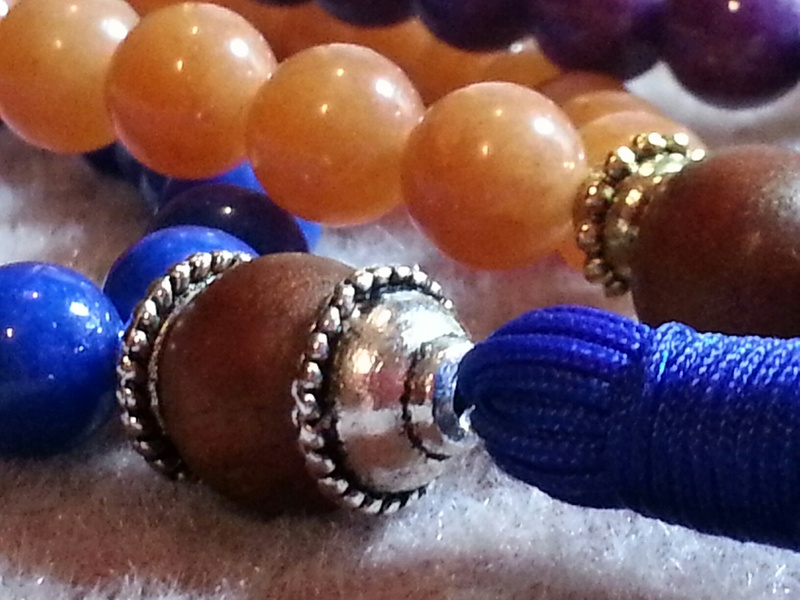 If I was making a mala for a specific person, I would learn what their intention was and infused it in my work. The outcome was a PrayerMala as unique as the individual for which it was created. The tassel, on the mala means enlightenment; that as a person uses their mala for chanting and reciting affirmations or prayers, the enlightenment that comes from such a practice is represented by the tassel. I feel that it holds the energy of the individual’s practice. I know that when I grab my favorite, long time used PrayerMala, if feel it calming me even before I begin to chant. I looked for pre-manufactured tassels to attach to the PrayerMalas I make, but as I began making PrayerMalas, I realized that the tassel needed to be integrated into the mala, not just simply attached at the end. I practiced on at least 2 dozen PrayerMalas before I found a perfect way to make the tassel. 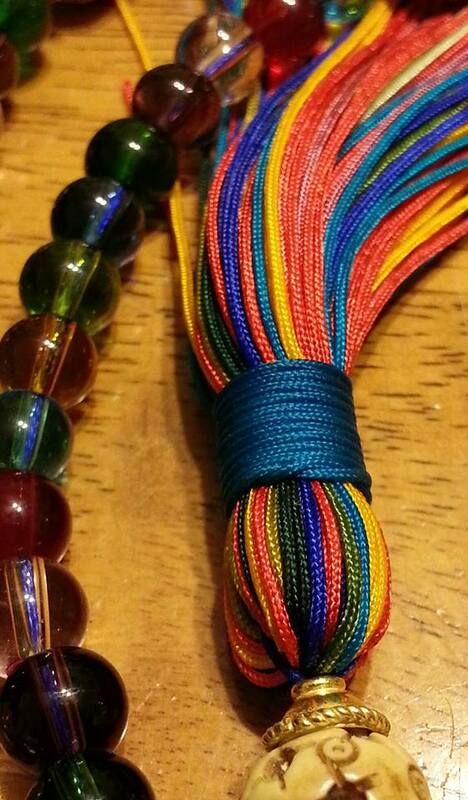 It takes a little longer, but it is stronger and flows organically from the string of beads. I chose to write the word “PrayerMalas” and “PrayerMala” as one word. It was how it called to me. It was my signature to the functional craft I was creating. After I learned about using beads to chant mantra, in the class I took on Spiritual Practices for Daily Living, I felt a weight lift from me. This new practice allowed for movement during this form of meditation. Sometimes the thought of being quite and still in meditation can be scary. So just as writing in a journal can release what is in a person’s mind, chanting mantra on a PrayerMala and the movement from one bead to another can allow the physical energy in the body to release and make space for the mind to open as the meaning of the words permeate the experience. I chose to move PrayerMalas.com to WordPress because it, just like all of us, are evolving, living and moving beings. The old website, as beautiful as it is, was not easy to change and could not engage with other people, sites and blogs. WordPress allows for that social connection. I am still working out how to display the PrayerMalas that I make and how “The Store” will function. 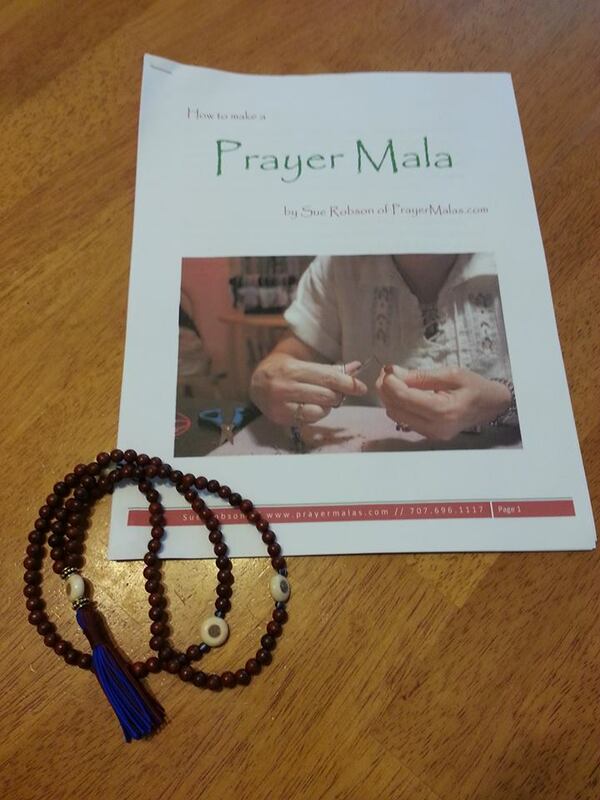 I will be listing when and where my workshops, “Strung with Love, How to make and use your own PrayerMala” will be held. I look forward to sharing and being a part of this community and reading blogs of other people who enjoy chanting, mediation, beads, prayer and art. This entry was posted in Community, PrayerMalas, Workshops and tagged Beads, Chanting, Mantra, Meditation, Prayer, Prayer beads, PrayerMala, PrayerMalas, Tassels, Workshops by PrayerMalas. Bookmark the permalink.